Many dancers forget that their heads should be in costume too. They might apply some makeup, but overlook the importance of doing something special with their hair. The end result makes them look unfinished. A pretty scarf, jewelry, or hairpiece adds an extra flair that finishes the transformation from a normal everyday person to a Dancer. This rectangular head scarf shown in this photograph is one option for completing the look. You can either make it out of the same fabric and trims as your skirt, or you can select an alternate fabric that coordinates well with other items in your ensemble. In this case, I was wearing two skirts. The overskirt was a circle skirt in the same red and gold fabric as the veil pictured here. The underskirt was made of the same red tissue lamé as this scarf. Photo by John Rickman Photography, San Jose, California. For an interesting variation, make three of these scarves, each in a different color of fabric, then braid them together. Tie the braid around your head in whatever style you choose, and let the ends dangle free. This looked great for a Christmas show, in which I used red, green, and gold together. Trim for outer edge: 3 5/8 yards (333 centimeters). See below for suggested trims. Although mirrored ethnic textiles are beautiful, they don't work so well for this scarf. Their weight causes the scarf to move awkwardly instead of flowing. The scarf can be worn without adding special trim to the short edges, but many people like to add it. 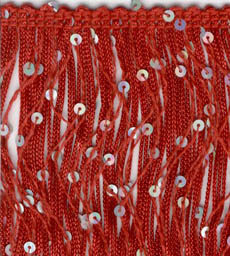 This photo shows the end of a scarf that uses edging made with paillettes and rocaille beads. Click on the photo to see more detail. Paillettes look like extra-large sequins with the hole near one edge instead of in the center. The recommended style is the one with a tiny hole that's just big enough for a needle to pass through. If possible, avoid the ones with a huge hole. The paillettes can be attached with either rocaille beads or size 10 seed beads. Rocaille beads are small beads with a silver lining. Size 10 seed beads are the same size as rocaille beads, but without the silver lining. Both types are made of glass. For 54-inch wide fabric (138 centimeters) Cut a rectangle the full width of the fabric (ie, 54 inches or 138 cm) and 6 inches (14 cm) wide. For 44-inch (112 cm) or 45-inch (114 cm) wide fabric Cut a rectangle the full width of the fabric (ie, 44 or 45 inches, or 112 or 114 cm) and 6 inches (14 cm). Cut two rectangles that are each 5 inches (12 cm) long and 6 inches (14 cm) wide. If your fabric was 54 inches wide (138 centimeters) you can skip this step. Otherwise, you'll need to sew the pieces together as shown in the diagram to the right. With wrong sides together, sew one of the 5-inch (12-cm) long rectangles to one end of the long piece. The seam should be tiny, about 1/4 inch (6 mm). Fold along the seam that was just made, but placing right sides together. Sew a seam that is slightly larger than the first one, perhaps 3/8 of an inch (10 mm), encasing the raw edges inside it. Repeat with the other 5-inch (12-cm) rectangle on the other end. Press the seams neatly to one side. If the fabric is likely to fray, turn under 1/4-inch (6 millimeters) hem on all edges. Click here for instructions on how to make an easy hem. Some dancers like to turn this hem toward the right side, instead of the wrong side, then cover it up with the trim. This eliminates having a visible hem on the wrong side. If sewing fringe on the short ends, attach it before adding the trim around all the edges. If sewing paillettes on the short ends, attach it after adding the trim around all the edges. Cut a piece of fringe that is the width of the finished short end plus 1/2 inch (12 mm) extra. Turn under the band to the wrong side 1/4 inch (6mm) on each end of the fringe and take a few stitches to hold it in place. Stitch the band that the fringe is attached to onto one of the short ends of the scarf. On each end, where the fringe was turned under, stitch back and forth several times across the turned-under section to make sure it will never have an opportunity to begin unraveling. Sew a row of single-strand sequin trim, soutache braid, or any other trim by the yard around the outer edge of all four sides of the scarf. Some trims can be attached using a sewing machine, while others look better if attached by hand. This is a beautiful way to finish off the short ends of the scarf. This method was used to finish the scarf Shira is wearing in the photo to the right. Follow the instructions for the Dangling Paillette Trim to attach about 10 paillettes evenly spaced across one of the short ends of the scarf. Repeat on the other end of the scarf. For a variation, sew about 6 or 8 paillettes to one edge of the very center of the scarf. When wearing the scarf as shown in the "Around the Forehead" section below, the center goes across the forehead, and those paillettes will sparkle on the forehead. There are several different ways to wear this versatile scarf. Some appear below to get you started, but do experiment. As always, it is important to practice dancing at home while wearing this scarf before actually performing in it, to learn how it moves and discover whether any adjustments are needed. This style is recommended for dancers with high foreheads or long, narrow faces. It serves the same function as a sweatband, only is much prettier. It also helps keep the hair out of the face while dancing. The photo below is by John Rickman Photography in San Jose, California. Click on it to see more detail. Take the center of the scarf into both hands, and gather it to about half the width. Place the gathered portion across the upper part of the forehead, so the scarf is right against the hairline. Pull the scarf around each side and tie it in a square knot securely in the back, directly behind the head, so that it's level all the way around. It will be on top of the hair. Run either a finger or a tail comb across the upper edge of the scarf to pull the hair out from under it. Lay that hair over the scarf so that the hair covers it all the way around, except for the center front at the forehead. Let the tails of the scarf hang down in back so they can be seen from under the hair. If you have bangs, pull them out from under the scarf if necessary. Style them as desired. For a variation on this look, place the knot on one side of the head, above one ear, instead of in center back. This will cause the tails of the scarf to hang down to the shoulder on one side instead of down the back. The seafoam green scarf in the above photo does not use either fringe or paillettes on the short ends. It has three rows of single-strand sequin trim outlining the complete scarf - the outer and inner layers are seafoam green, and the layer between them is silver. The "I Dream Of Jeannie" look is comfortable because it keeps the hair out of the face and lets the back of the neck stay cool while dancing. Draw the hair into a pony tail and secure it with a rubber band or other fastener. Place the center of the scarf underneath the pony tail and bring the scarf up on either side of it. Tie a secure knot around the pony tail. If desired, pull a few tendrils loose in front of the ear on each side and curl them with a curling iron. Wrap the scarf around the pony tail multiple times to make the knot area fuller and the loose ends shorter. Tie a second square knot and fluff the ends out to each side like butterfly wings. The above photo was taken by John Rickman Photography, San Jose, California. This style keeps the hair out of the face while dancing. Depending on the texture of the fabric, wearing a scarf in this way may make it easier to keep a sword balanced on the head. Imagine a line going from one ear across the top of the head over to the other ear. Place the center of the scarf on top of the head so that it is just slightly forward of that imaginary line. Draw it down each side of the head just behind the ears. Pull the ends back to the nape of the neck and tie a square knot so that it fits snugly. If there are bangs, style them as desired. Photo by William M. Smith, Sunnyvale, California. Click on the photo to see more detail. If you wear a hairpiece, tie this scarf wherever appropriate to cover the junction where the hairpiece meets the natural hair. Make a second scarf to match the first one in a color that contrasts with or complements the skirt. Use the center of each scarf to make a pouf, and tuck the pouf of each scarf into the hipband, one on each side.